Roll up to all the doom and gloom you could possibly want. See worlds devastated, people decimated, individuals coping, mostly not. Die in many interesting ways. Catch a glimpse of the world you will be entering some time very soon. This was a gift from my best pal Kit, who when seeing it in a bookshop knew I'd love it and I do. 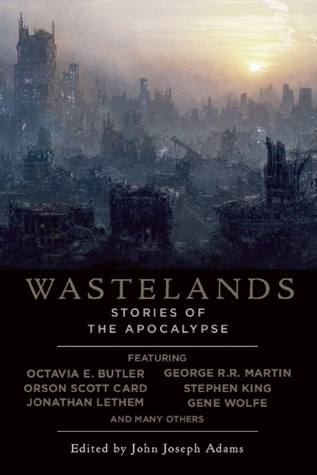 A fantastic collection of short stories by masters of apocalyptic writing. Edited by John Joseph Adams it is very judicial in choices and extremely varied. 'Lisa roasted the dog on a spit, burning plastics and petroleum skimmed from the ocean' by Paolo Bacigalupi. That should whet your appetites. The fascination with the end of the world is fed daily - whether by Islamic extremists or climate change pundits, and in our heart of hearts we know that given the choice when the lights go out and gas clouds drift towards us we would not really like to be amongst the living, fighting with AK 47's and rusted ammo for a mouldy carrot, but we can read about it from the comforts of our beds and dream of survival - only with hot showers and fresh bread - the least likely scenario. Hard to single out any particular piece as they are all good, but Mute by Gene Wolfe is clever where everyone has lost the power of speech , Ginny Sweethips' Flying Circus about a travelling whore amusing and Bread and Bombs by M Rickert relevant, as today in the news Paris wants to expel 20,000 Roma. I suppose Romania has been experiencing the apocalypse for the past 70 years - why stop now?